Gone are the days when USCIS used to receive more than 65,000 H-1B visa petitions within a day or two of the start of the H-1B filing period, April 1. Increased scrutiny, rising US visa fees, stringent new rules and other factors have led to a steep fall in the demand for the coveted H-1B visa. The H-1B visa was once upon a time one of the most sought after visas categories but it has lost its luster in the past few years. Indian IT companies, one of the prominent users of H-1B visa program, are now sponsoring fewer Indian professionals for the H-1B visa and prefer to hire US nationals, or, in the alternative, make intracompany transfers, or extend the tenure of Indian professionals already working on an H-1B. As of April 15, 2011, USCIS has received approximately 7, 100 H1B cap-subject petitions and 5,100 H-1B petitions for foreign nationals with advanced degrees. As such, USCIS will continue to receive applications for the H-1B visa until the cap is reached. Some immigration experts believe that since the H-1B cap was not reached until January 2011 for Fiscal Year 2011 and December 2009 for Fiscal Year 2010, the H-1B for Fiscal Year 2012 will also be open for an extended period time. Senator Grassley, one of the fiercest long time critics of both the L-1 and H-1B nonimmigrant programs, has called on the Inspector General of the Department of Homeland Security (DHS) to investigate the L-1 intracompany transferee program. Grassley has outlined specific areas of concern in his letter to Acting Homeland Security Inspector General Charles Edwards. Among those concerns are an unclear number of L-1 visa holders actually in the United States, a broad definition of “specialized knowledge,” a disconnect between the Departments of Homeland Security and the Department of State on blanket petitions, and the alleged use of L-1 visas to circumvent requirements of H-1B visas. Click here to read Sen. Grassley’s letter to Inspector General Edwards. 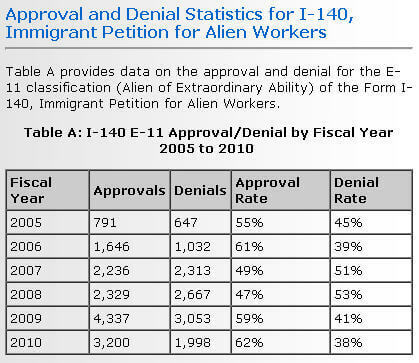 The USCIS has released Approval and Denial Statistics for EB-11 (Extraordinary Worker) and EB-12 (Outstanding Researcher/Professor) I-140 Petitions. The USCIS record reflects that EB-11 and EB-12 approval rates had been higher than 50% in general from FY 2005 through FY 2010. The approval numbers have steadily increased more or less. Click the following image to view the exact numbers of approvals and denials. USCIS has updated the count of H1B visa petitions received and counted towards the H1B cap for the fiscal year 2012 employment. As of April 15, 2011, USCIS has received approximately 7,100 H1B cap-subject petitions and 5,100 H-1B petitions for foreign nationals with advanced degrees. USCIS announced a final rule that adopts, without change, an interim rule to improve the integrity of the Employment Eligibility Verification (Form I-9) process. USCIS received approximately 75 public comments in response to the interim rule, which has been in effect since April 3, 2009. H-1B employees, whose timely- filed applications for extension of visas are pending before US immigration authorities, may not be arrested for “overstaying” now following a recent federal court ruling on the issue. Check out our In Focus section for this month, titled ‘Dual Intent – Did the Consulate Deny Your Nonimmigrant Visa Because of It?’ explains why most of the nonimmigrant visas are denied, the responsibility of a foreign national seeking a nonimmigrant visa, an introduction to the doctrine of dual intent and a list of nonimmigrant classifications that support the dual intent policy. Every month we introduce a new and interesting question for our opinion poll. Last month’s poll results indicate that 65.22 % of the respondents think President Obama is doing enough to fix the immigration system. We appreciate that people take interest in the opinion question and cast their vote to give us their feedback. Keep it up! And continue to cast your vote to express Your Opinion. We congratulate Mark Orlan for winning last month’s Immigration Quiz. Again, we received a significant number of responses from our readers, who talked about various solutions to support their position, but Mark Orlan gave the correct answer and won a free online consultation to discuss the concerned Immigration issues. So it’s time to get ready for this month’s quiz. If you know the correct answer your name might be featured in next month’s newsletter. All the Best!!! Senator Grassley wrote a letter to Secretary of State Hillary Clinton and Secretary of Homeland Security Janet Napolitano questioning the “B-1 in lieu of H-1B” policy currently in place. Grassley also referenced a formal complaint against Infosys that details how Infosys management in India decided to use the B-1 business visitor visa program to get around H-1B program restrictions. The plaintiff alleges that Infosys was importing foreign workers as B-1 business visitors under the guise of attending meetings rather than working for a wage as an employee of a U.S. company, which is forbidden under the statute and regulations governing the B-1 visa program. USCIS grants a cap-gap extension for F-1 students whose status would normally expire while waiting for an H-1B petition to be reviewed. This is allowed only for those students whose H-1B is filed on or after April 1 while F-1 status is current. Eligible students can go to their Designated School Official to have a cap-gap I-120 issued showing an extension. Released on April 1, 2011, more frequently asked questions have been answered. Department of Labor found that Maryland’s Prince George’s County Public Schools was willfully violating terms of the H-1B visa program by requiring the foreign national employees to pay fees related to the cost of filing for an H-1B visa petition, which the employer should have paid for. US Department of Labor orders $4.2 million in back wages be paid to 1,044 teachers and fines school system $1.7 million in civil money penalties. Senator Grassley has called on the Inspector General of DHS to investigate the L-1 intracompany transferee program. Grassley outlined specific areas of concern in his letter to Acting Homeland Security Inspector General Charles Edwards. Among those concerns are an unclear number of L-1 visa holders actually in the United States, a broad definition of “specialized knowledge,” a disconnect between the Departments of Homeland Security and State on blanket petitions, and the alleged use of L-1 visas to circumvent requirements of H-1B visas. Dual Intent - Did the Consulate Deny Your Nonimmigrant Visa Because of It? Most of the foreign nationals seeking nonimmigrant visas are unclear about the “presumption of immigrant intent” and suffer visa denials because they are unable to prove their temporary intent to remain in the U.S. This article explains why most of the nonimmigrant visas are denied, the responsibility of a foreign national seeking a nonimmigrant visa, an introduction to the doctrine of dual intent and a list of nonimmigrant classifications that support the dual intent policy. I am a British Citizen and two years back, I was transferred from a Foreign Company to a US Company on an L-1 visa. I was issued the L-1 visa for 3 years and it is still valid for another year. I have a friend who is moving to another city in US and I am also planning to move to that city with him. Will I be able to transfer my L-1 visa to another company if I get a job offer there? If not, what are the options available for me to remain legally in the US? I have master’s degree and a of total seven years of experience. The L-1B visa is company specific; it is not transferable to another US company. However, based on your experience and education, you would qualify for other visas. The most commonly used would be the H-1B visa, but as you probably know, there are no H-1B visas available until October 1, 2011. If you find a qualifying position, you may be able to use a J-1 visa as a stop gap allowing you to train or intern with the new employer until the H-1B becomes active in October. The J-1 visa can be used in the right circumstances for up to 18 months. I am an actor and have extensive experience in performing guest-star roles, theatre roles, and short films. Currently I am in the US on a tourist visa and have an offer from one organization who will offer me guest roles so I am planning to get my status changed to an artist visa. I would like to know what options are available for me? There are only 2 categories that actors or entertainers fall into, the O and P visas. The O visa is for those who have extraordinary ability, in other words, those who are outstanding, notable or leading in the motion picture or television field. The P visa has 3 subcategories: members of internationally acclaimed entertainment groups, individuals coming under a reciprocal exchange agreement, or someone who is coming for a culturally unique program. Your qualifications to date do not seem to place you at the top of your field, and you are not seeking to enter the US as part of an internationally recognized group, so the only classification that you can take advantage of would be a reciprocal exchange program. There are several organizations, mostly unions, that have exchange agreements in place. You would most likely have to become a member of one of these organizations to be able to use their exchange program.